The trains have long gone a different path, but converting resources of the past to utilization in the present was the theme last Thursday as project leaders, government dignitaries, and trail enthusiasts gathered in Ararat Township to officially open the latest trailhead along the D&H Rail-Trail project. The D&H Rail-Trail is a 38-mile long trail that extends from Simpson to the New York border near Susquehanna. 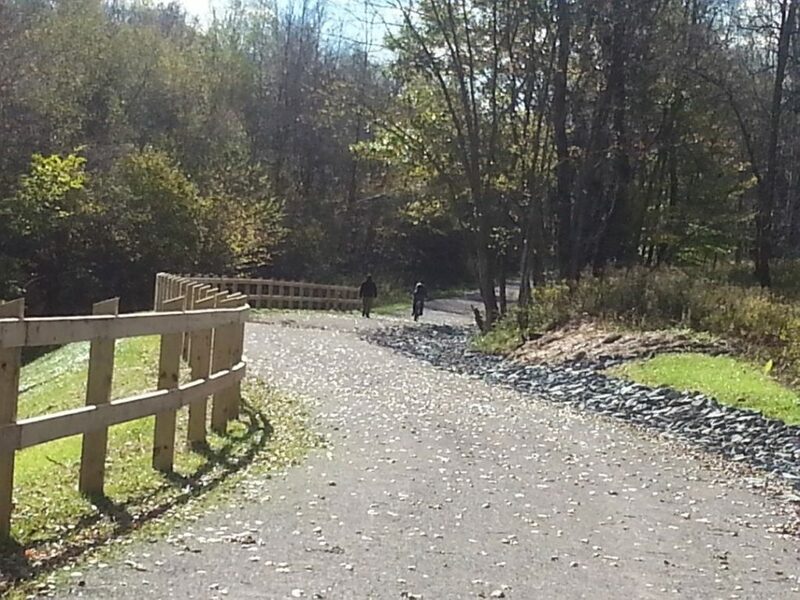 The trail connects with the Lackawanna River Heritage Trail combining to make over 70 miles of useable trail out of former railroad lines. “Our goal is to have a trail within 15 minutes of every Pennsylvania resident,” said Christine Dettore, Regional Advisor for the Pennsylvania Department of Conservation and Natural Resources (DCNR). Despite the brisk wind and chilly temperature, nearly 40 people gathered for the event at the Ararat Road Trailhead where 6.5 miles of improvements have been made from Herrick to Ararat. Rail-Trail Council of NEPA Executive Director Lynn Conrad opened remarks at the ceremony detailing the process of creating and updating the trails. She cited that the funding for the project is provided through three main sources: PennDot’s Transportation Alternatives Program (which Herrick Township sponsored), DCNR Recreational Trails Program, and the Trail and Greenways program from the state’s Department of Community and Economic Development (DCED). “It turns out you can’t build 10-miles of trail with the typical grant funds you get,” commented Conrad. Conrad explained that funding for projects like this is a series of gaining and matching funding sources. She stressed how important Herrick Township’s government involvement has been in this project. For the Council to receive funding through the Transportation Alternatives Program there must be a municipal sponsor of which Herrick Township agreed. The project was also able to secure funding through a fund matching program with the DCED that is tied to the Natural Gas Impact Fee money. 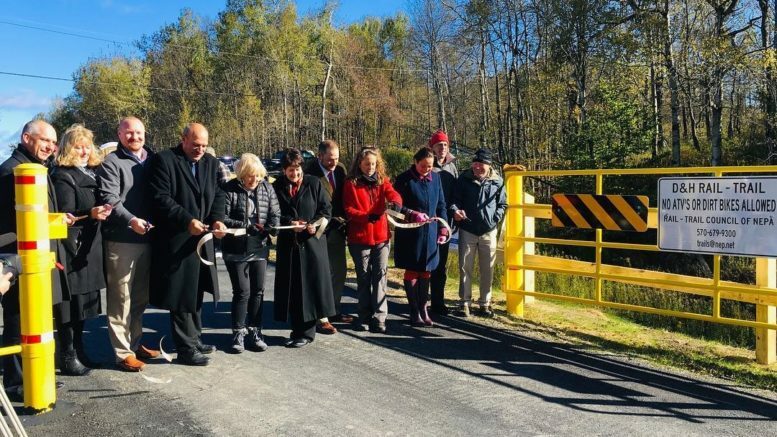 The cost of constructing this portion of the trail came at a cost of almost $1.6 million dollars, according to Penn Dot Transportation Enhancement Coordinator April Hannon. State Representative Jonathan Fritz (R-111th) noted how the trail is part of an extensive list of outdoor activities and opportunities in Susquehanna County and how the trail is important part of transforming the county’s past (the railroad lines) for use in the current day such as nature trail. “When you can take a preexisting natural asset, natural resource and you transform it, you evolve it, you are able to garner the benefits of that particular asset but at same time hold onto your heritage, your identity,” Fritz said. Herrick Township Supervisor Elliot Ross supported Fritz’s comments by relaying how the project ties into his own childhood memories of the railroad and how the trail can find a new use for a resource no longer utilized for its original purpose. “Many of my childhood memories center around Uniondale…. but always a bonus of visiting town was a chance of seeing the train pass through,” relayed Ross. The origins of the D&H Rail Trail and the Rail Trail Council can be traced to when the railroad was offered up for sale. Another aspect of the Rail Trail project emphasized is the economic opportunities for the towns along the trail. Paul Magnosky Regional Director of DCED, stated that throughout the 13-county region he oversees that the trails are a resource that communities are beginning to see utilized. “The trail areas are vibrant areas. It’s an opportunity for people to different parts of the area and are a great economic driver,” Magnosky said. 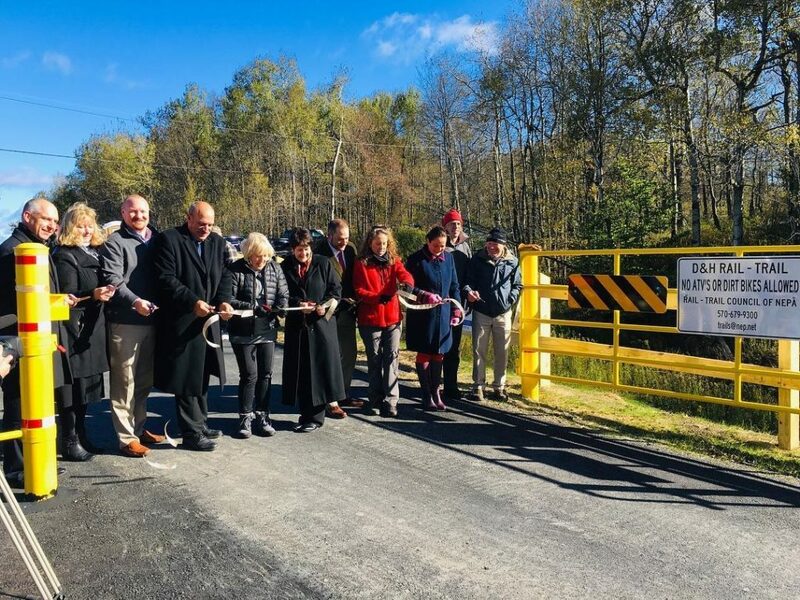 Susquehanna County Commissioner Alan Hall noted that the trail project can be part of establishing more tourism opportunities in the county which he called an under-utilized economic resource. “We forget about tourism, and I think it’s an area that (Susquehanna County) can dominate,” Hall said. Be the first to comment on "Ararat Road Trailhead opens"